A bullion coin is a coin struck from precious metal and kept as a store of value or an investment rather than used in day-to-day commerce. A bullion coin is distinguished by an explicit statement of weight (or mass) and fineness on the coin; this is because the weight and composition of coins intended for legal tender is specified in the coinage laws of the issuing nation, and therefore there is no need for an explicit statement on the coins themselves. The United Kingdom defines investment coins more specifically as coins that have been minted after 1800, have a purity of not less than 900 thousandths and are, or have been, legal tender in their country of origin. Under United States law, "coins" that fail the last of these requirements are not coins at all, and must be advertised as "rounds" instead. Bullion coins are usually available in both gold and silver, with the exceptions of the Krugerrand (note in 2017 the first silver Krugerrand was minted) and the Swiss Vreneli, which are only available in gold. The American Eagle and Canadian Gold Maple Leaf series are available in gold, silver, platinum, and palladium. Bullion coins are typically available in various weights. These are usually multiples or fractions of 1 troy ounce, but some bullion coins are produced in very limited quantities in kilograms or heavier. Bullion coins sell for a premium over the market price of the metal on the commodities exchanges. Reasons include their comparative small size and the costs associated with manufacture, storage and distribution. The amount of the premium varies depending on the coin's type and weight and the precious metal. The premium also is affected by prevailing demand. The ISO currency code for gold bullion is XAU. ISO 4217 includes codes not only for currencies, but also for precious metals (gold, silver, palladium and platinum, by definition expressed per one troy ounce, as compared to "1 USD") and certain other entities used in international finance, e.g. special drawing rights. The European Commission publishes annually a list of gold coins which must be treated as investment gold coins (e.g. by being exempt from VAT) in all EU Member States. The list has legal force and supplements the law. In the United Kingdom, HM Revenue and Customs (HMRC) have added an additional list of gold coins alongside the European Commission list. These are gold coins that HMRC recognise as falling within the VAT exemption for investment gold coins. The following list presents only the most common coins included in the European Commission list. New Zealand Gold Kiwi .9999 1/10 ozt, 1/4 ozt, 1/2 ozt, 1 ozt ?-present? 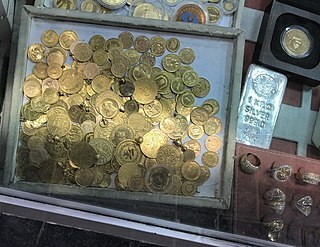 ^ "Investing in Bullion and Bullion Coins". Consumer Information - US FTC. U.S. Federal Trade Commission. May 2011. Retrieved 9 April 2015. ^ "VAT Notice 701/21A: investment gold coins". Gov.UK HMRC pages. HMRC. 1 February 2012. Retrieved 9 April 2015. ^ Bouvier's Law Dictionary (Revised 6th ed.). 1856. Retrieved 9 April 2015. ^ "Buy South African Mint Online - Silver | LPM". www.lpm.hk. Retrieved 2017-10-14. ^ "Official 2017 Silver Krugerrand - Premium Uncirculated". www.govmint.com. Retrieved 2017-03-31. ^ "American Eagle Bullion Coins for Investors". United States Mint. United States Mint. Retrieved 17 February 2018. ^ "BULLION PRODUCTS". Royal Canadian Mint Website. Royal Canadian Mint. Retrieved 9 April 2015. ^ "Lucius Precious Metals | Buy Gold, Silver, Bullion & Coins". www.lpm.hk. Retrieved 2017-10-14. ^ "Buy Physical Gold Bullion, Gold Coins & Gold Bars | LPM". www.lpm.hk. Retrieved 2017-10-14. ^ "Table 2: UK list of additional coins recognised as investment gold coins" (PDF). Gov.UK HMRC pages. HMRC. Retrieved 9 April 2015. ^ "Melita bullion coins 2018". Central Bank of Malta. Archived from the original on 21 January 2019. ^ "Ukrainian Gold | LPM". www.lpm.hk. Retrieved 2017-10-14. ^ "Tuvalu 1oz Rhodium Coin". Baird Mint. Retrieved 17 June 2018. ^ "Investment coins of the Republic of Armenia". Central Bank of Armenia. Retrieved 15 May 2014. ^ "Chinese Panda Silver Series". Bullion Data. Retrieved 20 April 2012. Wikimedia Commons has media related to Bullion coins.